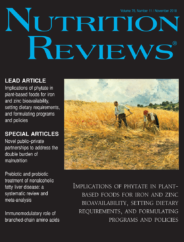 Nutrition Reviews is a highly cited, monthly, international, peer-reviewed journal that specializes in the publication of authoritative and critical literature reviews on current and emerging topics in nutrition science, food science, clinical nutrition, and nutrition policy. From packaged food products on the supermarket shelves to calories listed on menus in fast food outlets, food labels and the nutrition information they contain are all around us. But what effect do these labels have on consumers? Does food marketing influence what you actually eat? Previous research has shown that food labels are a useful tool to assist consumers in making healthier food choices. They have also been found to influence how healthy people perceive products to be. For example, when an unhealthy food product was labelled with the Smart Choices logo, which is used to indicate a healthy food product, people believed that the product was healthier and contained more nutrients than the same product without a logo. While there is a lot of research on the impact of food labels on our purchasing and food selection choices, there is little research on the impact of food labels on how much we actually eat. Researchers at the University of Newcastle, Australia conducted a systematic review of the literature to attempt to answer this very question. Instead, they discovered there was no clear cut answer, as food labels were considered to have both a positive and negative role in influencing how much food people consume—as well as having no role at all. There were nine different food label types identified in this review, and all but one label category (persuasive language labels, i.e. language intended to persuade consumers with words such as “wholesome” and “natural”) had a positive effect on consumption. This means that eight of the nine types of labels decreased consumption of ‘sometimes foods’ (energy-dense, nutrient-poor foods) or increased consumption of healthy, everyday foods (nutrient-dense foods). These findings show that food labels can influence consumption in a way that can improve short-term intake and therefore, have the potential to encourage the consumption of more appropriate portion sizes. However, all but one label category (exercise equivalent labels, i.e. those that contain information related to the amount of exercise required to “burn off” the food) also had a negative effect on consumption. This means that they increased consumption of energy-dense, nutrient-poor foods or foods eaten outside of the home, which has been associated with a higher intake of energy, fat and sodium. These findings support previous research that found that when a food label emphasized one aspect of the food as healthy, it can lead to the creation of a “health halo,” whereby individuals increase their intake because they believe that they can consume as much of the food as they like without guilt or fear of weight gain. For example one of the studies in this review found that labeling foods as low calorie may create a halo effect which may lead to over-consumption of these foods in people who usually restrain their food intake. Finally, in this review it was found that all but one label category (Nutrition Facts labels) had no effect on portion size. These findings are in line with previous research, which found that calorie menu labeling has no effect on calories from foods ordered or consumed. So what does all of this mean? Are food labels helpful or unhelpful? Will they encourage you to eat more of the good stuff or trick you into eating the whole tub of yogurt because the label has the word ‘wholesome’ displayed? Well, the University of Newcastle review has definitely highlighted that there is no clear cut answer to this question, and that the topic itself is actually quite complex. Grouping the studies together and comparing the results is difficult, because labels such as those containing energy and fat information had been tested to a much greater extent than more recent food label types, such as exercise equivalent information. Furthermore, there was a large degree of heterogeneity within the included studies, both in widely differing methodologies used to evaluate the impact of food labels, as well as the way in which data were measured and reported. The most important thing to keep in mind when reading a food label is to remember that it is there to provide you with information to help you make safe and appropriate eating choices. So ignore the buzz words displayed on labels such as ‘wholesome’ and ‘superfood’. They don’t mean anything. Look past the colorful images and symbols that are designed to attract your eye and focus on the nutrition information panel and the ingredients list. This is where you will find all the information you need to make appropriate choices. Hannah May Brown is a PhD candidate from the University of Newcastle and an Accredited Practicing Dietitian (APD). Hannah graduated with First Class Honors in a Bachelor of Nutrition and Dietetics in 2015 and has published articles related to the influence of food labels on portion size. Hannah’s PhD research is aiming to improve the dietary knowledge and food skills of pregnant women, with a focus on carbohydrate portion sizes, to improve diet quality and health outcomes of both mother and child. Hannah's research also involves the assessment of portion size tools, including food labels, smartphone apps and augmented reality, on improving knowledge and portion size selection.